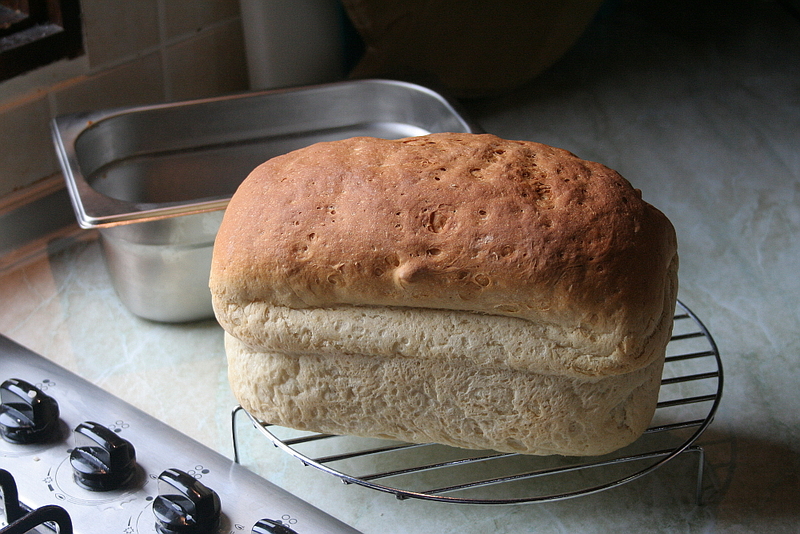 For the last seven or eight years I have tried, off and on, to make my own bread. I’ve succeeded with various flat breads and even made a passable pizza dough occasionally but a properly shaped country style loaf has eluded me. Many of them have turned out like small bricks and nearly as heavy. My lack of a decent bread tin to bake a loaf in has been one of the problems, all I had was a rectangular cake tin with not enough height in the sides but while in Marmaris ten days ago I was taken to a shop selling professional kitchen supplies and equipment. In there I found a small serving tin of the type used in a heated servery in a canteen or self service restaurant. Stainless steel and about ten inches long, five wide and deep. Once I got back home I tried it out, the first was a disaster as the dough was too soft and rose so far it spilled over the sides and had to be cut out of the tin. A little less yeast on the next attempt and it was perfect. This is not to say that there is something wrong with the bread produced in Turkey. A wide variety is available here and usually very nice it is too but in winter when the rain is lashing down and I don’t even want to venture out to the next village (where the baker is) the ability, knowledge and desire to make my own is something that I value. The dogs like to get the end crusts too. Another plus is that I can make a good bacon and egg sandwich, most of the Turkish bread is not the right shape for a proper sandwich so I’m winning in more than one way. Now the only thing I have to do is adjust the recipe a little so that I can use the flour ground from the locally grown wheat and I’ll be really happy.